Washington's salt marshes and pocket estuaries are incredibly diverse and productive habitats. Unfortunately, they are also highly threatened by shoreline development, pollution, and now, a potential invader. European green crabs (Carcinus maenas), often listed as one of the world's worst invasive species, are now poised to enter Washington's inland waters along the Strait of Juan de Fuca and Puget Sound. 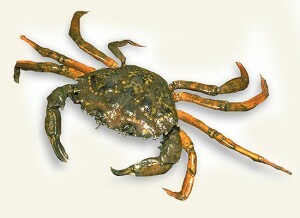 This crab has invaded nearly every temperate marine habitat worldwide, and has been found on the outer coast of Washington and Vancouver Island, B.C. since the late 1990s. Locally, they are continuing to expand their range, and recently established a population in Sooke Inlet, west of Victoria - marking their entrance into the Salish Sea. Join us for an introductory talk about the history and ecology of the green crab invasion, and to learn how you can help protect your local shorelines.